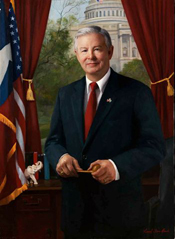 BARTON, Joe Linus, a Representative from Texas; born in Waco, McLennan County, Tex., September 15, 1949; graduated from Waco High School, Waco, Tex., 1968; B.A., Texas A&M University, College Station, Tex., 1972; M.S., Purdue University, West Lafayette, Ind., 1973; business executive; White House Fellowship, served as aide to Secretary of Energy James B. Edwards, 1981-1982; elected as a Republican to the Ninety-ninth and to the sixteen succeeding Congresses (January 3, 1985-January 3, 2019); was not a candidate for reelection to the One Hundred Sixteenth Congress in 2018; chair, Committee on Energy and Commerce (One Hundred Eighth and One Hundred Ninth Congresses). Videocassettes: 1986-1988, 4 commercials on 2 videocassettes. The commercials were used during Joe Linus Barton's campaigns for the 1986 and 1988 U.S. congressional elections in District 6 of Texas, Republican Party.